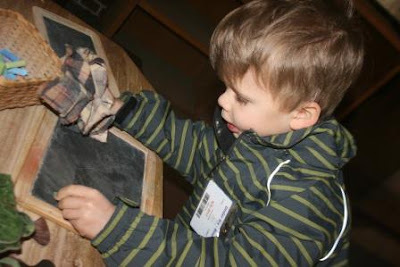 The weather was chillier than normal on the day the boys and I went to Colonial Williamsburg. We picked up 'Kids Spring Adventure Maps' for all 3 boys which allowed them to collect hole punches on various places to save up to earn a keepsake pin. It was tough to tear Pierce away from the chalk boards at The Gateway Building. 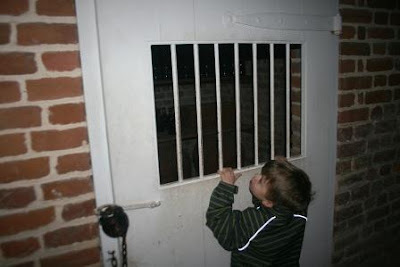 But I wanted to tour the Governor's Palace before the wait got too long. There was already about a 20 minute wait to get in when we got there, at around 9:10 am. Pierce was a little horrified by all the guns, and said so quite loudly. I must be doing my job right (ha ha). I spent 5 years as a juvenile probation officer, and I can't help myself - I want my boys to understand that guns are never to be thought of as playthings. I confess that the ornateness of the arrangements were beautiful though. We didn't find that particular cemetery, but we did discover the cellar! Pierce couldn't wait to go in. Reid said it was scary. Pierce tries to peak in at the stores of food. They had many rooms that stored food beneath the palace. 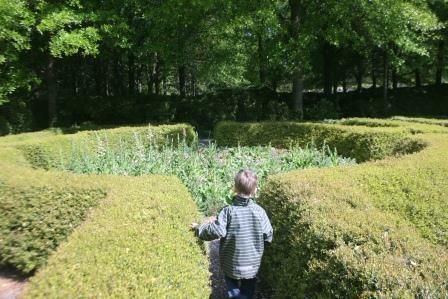 We also found this spectacular maze! Sadly, our double stroller wouldn't fit in the rows, but we did climb up on the mount to view it from above. And we were able to cram our double stroller in this maze, which wasn't as tall and didn't have such narrow paths. Stay tuned! Next up will be one of the coolest cemeteries I've ever seen! CW is our favorite place to vacation! We have been there 5 times as a family and my wife has been there in the double digits since she was a child. It is only 6 hours away from our house. You need to try out the WB Pottery Factory if you have a chance, best place to by a bird bottle or plants. They have a big green house! You all have fun! 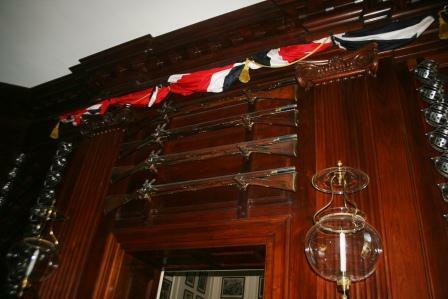 We never toured the Govs Palace when we were there. I guess all I went for was the pottery and the green house. I had no idea you used to be a juvenile probation officer. I bet that was a really tough job. I am impressed the twins did so well in the palace. It is an amazing place. I would love to wander through that maze! How fun! That looks like a fun day! 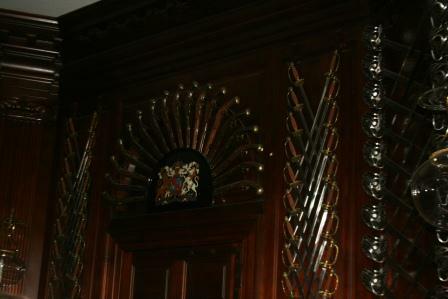 The castles in Europe are full of armories too--all the weapons on grand display--probably where that came from! I love trips to historic locations like that! I'm glad you were able to take the boys around to see such neat things. Oh, and I love the blue of the interior paint. I think one of the reasons I love history so much is because of all the trips like this that my parents took my two sisters and me on when we were kids. I love the ornateness of the Governor's Palace too! I wish they still built buildings like that today. 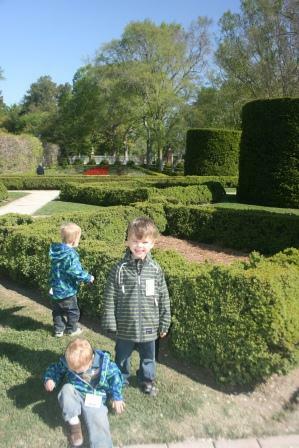 Interesting and fun outing for your three little guys! 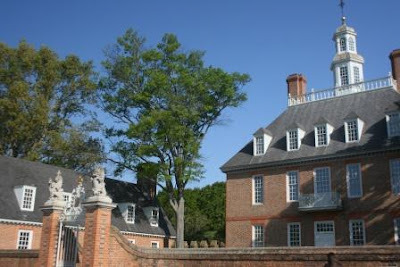 There's so much to see in Colonial Williamsburg. I haven't been for a tour since I was a little girl, but I remember how fascinated with it all I was. I also remember that my parents bought me some paper dolls with Colonial-era clothes. Bless you for wrangling 3 small kids through all of that! We visited C.W. one time and were too overwhelmed by it all. It's definitely worth several visits!! Well I am jealous. We used to make CW an annual stop--we all looked forward to it. Love this, Lisa! I've never been, and so appreciate the photo's. The boys, as usual, are adorable. I applaud you once again for the places you take them too. I love old cemeteries also, and will be looking forward to your post. Gorgeous! I would love to visit! 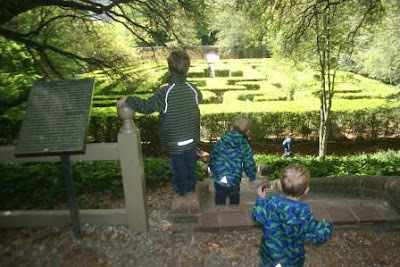 I love the pictures, especially of the boys by the maze! 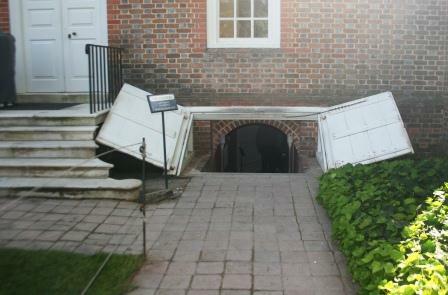 I can see why Reid would be afraid of that cellar, though! Cannot WAIT for the cemetery post, you know I love cemeteries! We just drove all the way to Richmond to go to Hollywood Cemetery, it is over 100 acres and even has it's own street names. It is amazing, very historic, and is in my book "Remarkable Trees Of Virginia". They have brochures and even give tours, also some famous people are buried there. Wow sweetie, that looked like it was the perfect adventure for you and the boys!!! Their so stinkin' cute! Oh the woodwork inside is amazin'. 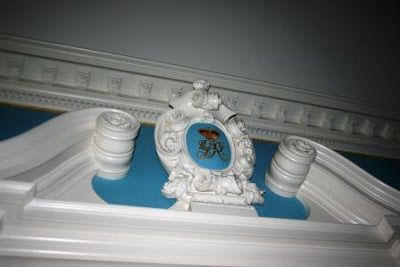 they just don't put that kinda work into a building now and I miss it! Yep, I'm with ya on the guns. Our kids grew up with guns 'round but they learn at an early age their not a toy and are to be respected. I grew up in suburban Richmond and every year of my elementary school life I went to Williamsburg. It lost its thrill about the third year but loved seeing it through your eyes. Lisa, how fun! 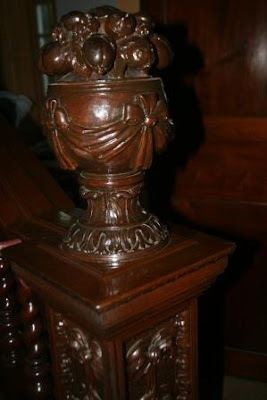 The mansion was so pretty...I love the knob on the stairs! The gardens are exquisite and I know your boys had a grand time running here and there! I would LOVE to visit Williamsburg someday! 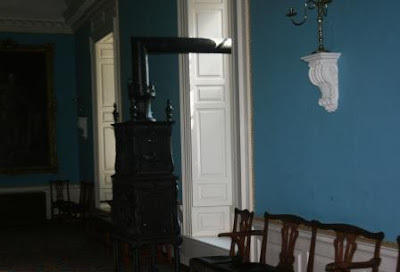 Mazes, colonial architecture, history... Yup, My kind of place! Glad you enjoyed the Governor's Palace. Williamsburg has so many things to see. Hi Lisa, Oh how I love Colonial Williamsburg... Some of my Ballard ancestors came from there... In fact, one of them is buried at Bruton Parish Church cemetery in Col. W'burg... SPECIAL place to me--for many reasons!!! Looks like a wonderful trip! Love all the pictures! Wow 3 little boys and by yourself? You are brave. They must be better behaved than most of the children I've encountered lately! I'm a real sucker for historical tours. But sice I'll never visit there-thanks taking me along! Great pictures! It looks like you had a fun day! I always wanted to do a garden maze. Looks so fun to get lost in! Your picture tour is great. Especially liked the blue and white embellishment above the door. I was raised around guns but was also taught how to handle them properly and respect them. What a beautiful place! I too love old cemeteries so I am looking forward to the next post.